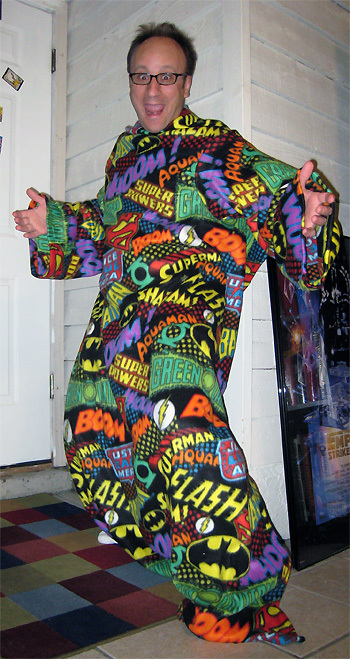 OMG, I bought a Snuggie… Have I lost my mind?!?! 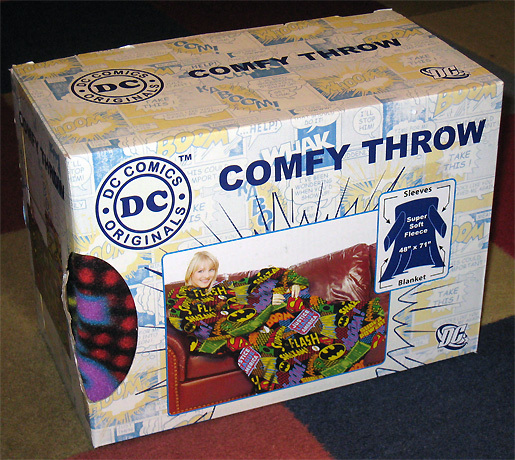 I bought a DC Comics Snuggie?!?! First off, it’s not really a “Snuggie”, it’s a “Comfy Throw”. What does that mean? That means it’s a body-length blanket with sleeves made of fleece material; similar in design to a bathrobe that is worn backwards. Yeah, I know. That’s the definition of a “Snuggie”. This is DC Comics’ off-brand version of a Snuggie. I picked it up at F.Y.E. in Tampa for $10 (originally priced at $20). The dimensions are 48″ x 71″. Upon seeing the box (and after finishing rolling her eyes), my wife stated that no woman would be caught dead in that thing, and the only reason a woman is wearing one on the box is because it will help sell the product to geeks. Y’know what, I think she’s exactly correct! When I bought it, I never really thought I’d wear it. However, my Comicatorium (a.k.a. Shag’s Sanctum Sanctorum) is about 10 degrees colder than the rest of the house. So on cold winter nights this thing could actually come in handy! In fact, I’m wearing it as I type right now. It’s currently 32 degrees outside and freakin’ cold in the Comicatorium, but I’m all mosty-toasty in my DC Comics Snuggie. 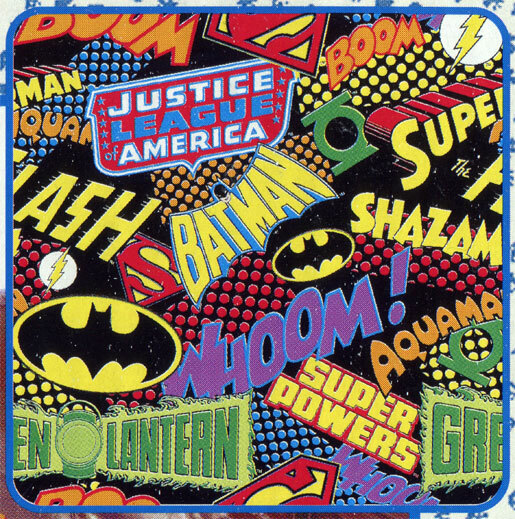 Here is a sample of the pattern featuring: Superman, Batman, Aquaman, Green Lantern, Shazam, Justice League of America, and the Super Powers logo. Finally, proof positive that I have no sense of shame. Holy crap, dude! That looks like it could actually be a villain costume from the 70’s. You’re braver than I am. Or, really, more of a geek. You’re a nerd to extreeeemmmme! You should wear that to DragonCon. that pic of you is f’n hysterical. don’t be ashamed…those logos on that snuggie are awesome! Seriously, you look like a super villain – or a superhero I suppose. If we’re gonna give him a supervillain name, let’s make it a legacy one. You’re the new Crazy Quilt, Shag. Now go buy some festive headgear to complete the outfit. friends don’t let friends buy snuggies (or Comfy Throw blankets for that matter)…Unless it makes your friend look that damn silly. Serv manipulates Shag into the store and allows him (and Booty-Man) to buy that thing FTW! Oh. My. God. That is the funniest thing I’ve seen all week! You have to wear that at Dragon*Con now. Even better than a 70s super-villain, imagine: a secluded mansion. A large, stone room, the floor cleared, lit only by candles and a small brazier in the center of the room. A dozen figures wearing these Snugg–er, Comfy Throws, standing in a circle around the brazier, chanting in a long-forgotten language. Has your wife tried it on yet? My wife stole my “Snuggie” after she tried it on… (Mine is actually “slanket” I think? I haven’t had it all winter now. Wear your DC Slanket with Pride Shag! Your wife is wrong. I am female and I would totally buy/wear that. LOL That is great! I have not purchased a snuggie nor have I tried one on but this one is great! I would jump into this one. The picture is to funny! Shag borrowed this from Harry Potter…the Cloak of Geekability. All you need now is the Wizard cap and magic wand LOL. SERV!!! Why the hell you throwing a fellow geek under the bus? I swear, I returned mine… I swear… I am not using at all… I’m not. Really. Seriously. But I hear it is quite warm and easy to slip on in the middle of the night… So I hear. The chaos that is Serv44 continues to RAGE! That’s not Shag, that’s a new DC villain. I think he’s related to the Riddler. What? No Hawkman logos?! WHAT THE HELL ITS SO TYPICAL UNFAIR HAWKMAN GETS SO JOBBED OUT RARGKHWKLHSJKLHKLMNSKLHDJKBHEWJKLBEJKB!!!!!!!!!!eleven. Luke – Firestorm got dissed too. Not fair. I would totally wear this too, and I’m a women. I have a Star Trek snuggie.